Shakeology broke every rule in the nutrition marketing book because it put quality above all else. But even we were blown away at the outpouring of doctors who ordered and volunteered their support for this amazing product. One of the very important aspects of Shakeology is that you are able to get vitamins in a way that your body can actually utilize them. This is important because there are a lot of individual supplements you can take but if the supplements aren’t given to you in a particular way or order your body cant utilize the supplements properly and they will pass through unabsorbed. 30 Day Money Back Botton Of The Bag Guarantee! This patent-pending daily nutritional shake helps your body gently eliminate toxins more efficiently while allowing for better absorption of the essential nutrients you need. A proprietary blend of digestive enzymes and prebiotics helps your body progressively eliminate the toxins that build up over time from eating today's highly processed foods. "I never used to eat breakfast. I would make myself a big pot of french press coffee and sip on it all day until it was time for lunch. Now I make my Shakeology up in the morning, I don't even need coffee anymore because it gives me so much energy! I crave it! Funny enough my number one craving when I was pregnant was Strawberry smoothies. If only I knew about Shakeology then!" They lowered their total cholesterol levels by an average of 30% and their "bad" cholesterol levels by an average of 38%. *In an independent 90-day study, participants replaced one meal a day with Shakeology ® and exercised regularly. The above is what the doctor who ran the study observed about the participants. 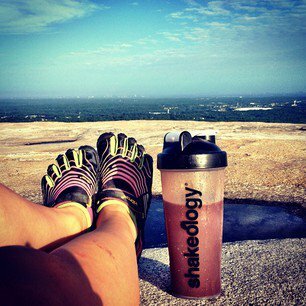 Get Shakeology + Fitness Program Now!